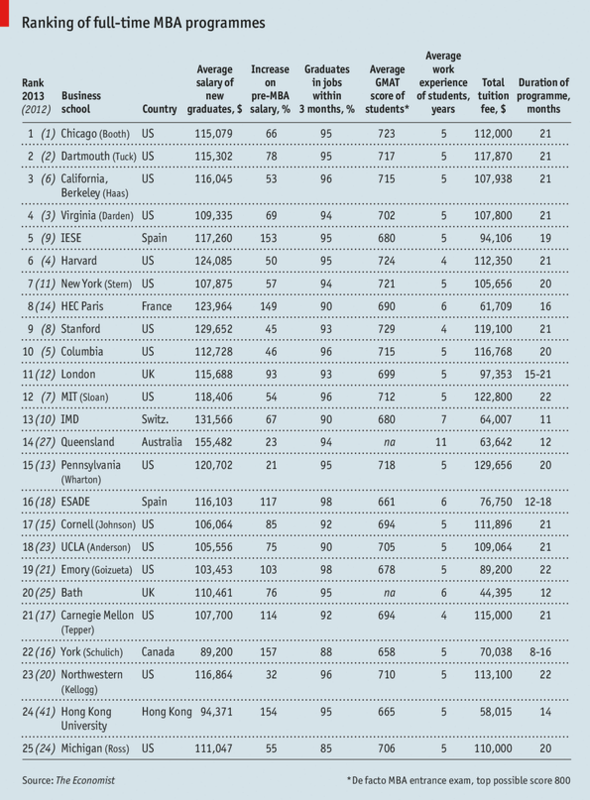 The Economist has published MBA Ranking 2013. It coveres such categories as: new career opportunities; personal development/educational experience; salary increase and the networking opportunities. Chicago Booth Business School has managed to retain first place in the annual rating of full-time MBA programs according to The Economist 2013. The school has taken top positions three times over the last four years. Especially surprising information is in the line “Employment Statistics ”, that demonstrates the vast range of areas and the average starting salary after graduation from the MBA in the amount of $ 115,000, which is 60 % higher than the salaries before entering the business school. The students, meanwhile, give the highest marks for the quality of the education they received, for their classmates, and for the school's career center. American programs occupy the first four places and 16 out of 25 places in the ranking in general. The leading European school is IESE in Spain, which, in spite of the difficult economic situation in the country, still manages to provide many of its graduating students with good jobs, mostly at foreign companies. Queensland School in Australia has risen in 13 positions this year. But the rise of Hong Kong University, the top Asian school, has become the most precipitous. It has climbed 17 places and has broken into the top -25 for the first time. This is the 11th Economist ranking published by this time. It is based on the surveys of the students of MBA programs every year. Why they decided to enter the MBA and what is the most important thing during their studying are the principal questions in the surveys. and the possibility of new relations (10%). All given figures are a mixture of accurate data and subjective evaluations of students of business school.